Phase 2 of The Self-Published Fantasy Blog-Off 2016 is officially underway! For the six-month period from November 1, 2016 to the end of May 2017, we will be reviewing the ten finalists chosen by the blogger judges from the first phase of the competition. For full details and the list of books, see our SPFBO 2016 page. There’s a lot to say about Outpost by F.T. McKinstry. Rich in detail and beautifully written, the book features incredible world-building, taking place in a fantasy setting that breaks the bounds of expectations. The cultures and concepts and creatures portrayed in this novel are also brought to life so vividly that they practically leap off the pages. That said though, if you’re looking for a story that grabs you right away, this one might not be for you; there are many things going on beneath the surface, and McKinstry arguably takes a slow-burn, tantalizing approach in drawing out its mysteries. It’s therefore a book that might require a fair bit of patience, but could be worth it. 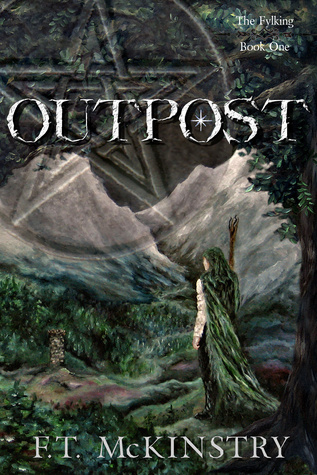 Outpost introduces us to the world of Math, an epic fantasy realm steeped in both political and military conflict. Complicating the situation is the presence of unseen immortal warrior creatures called the Fylking, said to have originated from another dimension by coming through an ancient portal. The Fylking themselves are fighting a war with an enemy called the Niflsekt, using Math as a strategic outpost after training a select group of human seers as Wardens to guard the interdimensional gate that leads back to their home world. Wardens also have the ability to see the Fylking, who may take on the avatars of animals when they need to communicate, but generally they are invisible to the rest of the population. After two centuries though, human seers are disappearing, and without the eyes and ears of their helpful Wardens, the Fylking are threatened with the possibility of continuing their war blind. The story follows three POVs. First is Othin, a Ranger sworn to protect the people of Math. A fierce fighter and a free spirit, he patrols across the land, guarding travel routes and enforcing peace in towns. His fellow Rangers respect and look up to him, and he also receives no small amount of attention from the smitten ladies wherever he goes. Othin’s heart, however, already belongs to a young woman named Melisande. Millie, as she is called, possesses a special kind of gift called Pattern Sense – a type of magic they say is touched by the gods. To the people who live in Millie’s village though, that kind of power is difficult to understand, and she becomes ostracized, distrusted, and labeled a witch. Finally, there’s the seer Arcmael, the disavowed oldest son of a prominent lord. Little did he know, being banished from his home would lead him on the path of becoming a Warden, trained by the Fylking and tasked to guard their gateway, even though Arcmael has sworn never again to take up the sword. It probably comes as no surprise, one of the most alluring aspects of Outpost was the world of Math. This is high fantasy with a heavy emphasis on lore, highlighting the sense of age and intensity. This is, after all, a story involving a race of beings who have been around for a long, long time. They have changed the face of the world and influenced the culture of its people. Admittedly it’s a lot to take in, but the world-building being far more interesting than most, getting the hang of it was a lot easier than I expected. It might also help to check out the glossary in the back to familiarize yourself with the many names of places, people, and terms before you start, which would make the avalanche of information a little less overwhelming. I guess in a way, the author’s love for detail can also be considered a double-edged sword. McKinstry writes gorgeously, but despite the excellent prose and the novel’s great setting, her style can take some getting used to. I mentioned the rich level of detail, but at times the overburden of information can come at the cost of potential confusion, as well as plot pacing. I confess I found the story to be on the slower side, and if you have a busy schedule that limits your reading time to short bursts here and there (like it did in my case), it’ll take a lot more motivation to pick up the book again and to keep pressing on. I also enjoyed the characters, but did not take to them all equally. My favorite was perhaps Othin, whose “classic hero” persona belies a more complicated spirit beneath. He may come across a bold, somewhat rash fighter who works hard but plays harder, if his tavern habits are any indication. The truth is though, he’s a real softie. I liked this mellower, more romantic side of him—which might actually explain my eventual disappointment in Melisande’s character. So much of Othin’s motivations were bound up in his love for her, but I had a hard time feeling it, especially with his initial dismissal of their courtship as casual. They shared very little page time together too, which didn’t help. I also wished Millie had a more active role in the story, especially since her Pattern Sense is so interesting. My least favorite character was Arcmael, however, whose chapters were the toughest to get through, which is ironic considering how much I enjoyed reading about the Fylking (as a Warden, Arcmael’s POV gave us the most information about them). I think most of my problems with his character stem from the fact that we don’t get to know the truth of his origins until closer to the end of the book, and so many of his early motivations are hard to understand. Despite my issues though, I definitely enjoyed Outpost. To sum up, it’s a solid self-pubbed novel. McKinstry can write, and she has the imaginative vision to create this incredible, fascinating world to stoke the envy of fantasy writers everywhere. To truly grab me though, the story could have used some streamlining to improve the pacing, and the characters probably needed more impetus. But overall, I had a good time. I’ve wanted to try this one since I featured it on my blog months ago. I just never manage to one-click it for some reason. I think that if the writing isn’t bad, I will enjoy it. I like the idea of the beings from another dimension: it adds a touch of difference to the usual patterns of the genre, and almost seems like a (happy) contamination with SF – it’s intriguing enough that I might try it out. Thanks for sharing! I really liked that aspect of it! It’s very much a high fantasy story, but liked the little touches that make me think sci-fi too. Now you mention it I didn’t particularly get on with Arcmael’s chapters – I hadn’t really thought about it but he’s not the easiest character to engage with. I liked Melisande and her pattern sense – it was just so intriguing and I don’t think I’ve every read anything like that before – I would have liked it if her and Othin had spent more page time together though. Othin was very likeable and rough and ready – he sort of put me in mind a little bit of Angus Watson’s character Dug. Overall I really enjoyed this. I wish it had been a little more fast-paced, but like you said, it’s hard to get that plus the marvelously scrumptious writing at the same time!